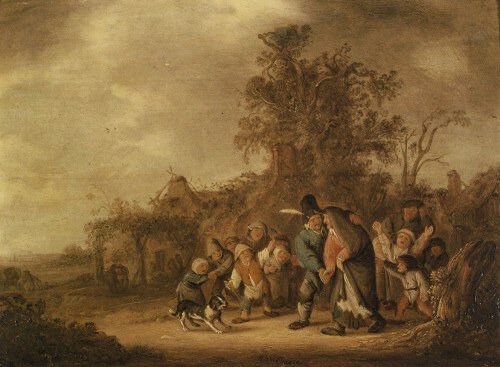 In a career that lasted just over a decade, Isaac van Ostade—the younger brother and likely pupil of Adriaen van Ostade—developed a distinct style marked by both a masterful incorporation of landscape into scenes of peasant life and a predilection for humorous representation of the lower classes. Here, the artist treats the subject, an inebriated woman vomiting, with a moralizing sense of comedy. The theme relates to overindulgence and its negative consequences, cautioning the viewer to avoid the antagonism and shame suffered by the protagonist. The artist repeated this suite of figures on a smaller scale in the foreground of one of his painted landscapes, altering the poses and colors and setting them off against a more muted backdrop. He also omitted the spewing vomit central to the drawing—leaving more ambiguous the source of the woman’s ridicule. [Amsler and Ruthardt, Berlin, 25-27 May 1908, lot 376, repr. pl. 2]. Dr. Gottfried Eissler, Vienna (L. 805b, verso, lower left). Anton Schmid, Vienna (L. 2330b, lower right). [Galerie Arnoldi-Livie, Munich], sold; to Maida and George Abrams, Boston, 1989 (L. 3306, without their mark); The Maida and George Abrams Collection, 2008.256. Little is known about the brief life and career of Isaac van Ostade, the younger brother and, according to Houbraken, the student of Haarlem’s master of the peasant genre, Adriaen van Ostade (see 1999.123.10, 2009.206 ).1 Although his career lasted just over a decade, Isaac developed a distinct style marked by a masterful incorporation of landscape into scenes of peasant life and a predilection for humorous representation of the lower classes. The drawing on the verso of this sheet is one of a small handful of Isaac’s rare early landscape studies.7 The tufty leaves and the schematic, rapidly drawn peasant house are typical of these sheets, as is the use of brown ink and wash. Isaac later refined this approach in subsequent masterful drawings of unpopulated exterior and interior scenes that show a more controlled use of the pen, greater level of detail, and frequent use of watercolor.8 His early compositional studies and landscapes, as embodied in the recto and verso of Harvard’s sheet, helped Isaac cultivate the mature paintings of exterior genre scenes for which he is best known. 1 Arnold Houbraken, De groote Schouburgh der Nederlantsche Konstschilders en Schilderessen (first ed. 1718–21; reprint Amsterdam, 1943), vol. 1, p. 273; Irene van Thiel-Stroman in Pieter Biesboer and Neeltje Köhler, eds., Painting in Haarlem 1500–1850: The Collection of the Frans Hals Museum (Ghent, 2006), pp. 261–62. 2 Van Ostade’s earliest dated painting (whose dating itself would generally indicate independence from apprenticeship) is from 1639. On 31 January 1643, the rolls in the archives of Haarlem’s Guild of Saint Luke record a dispute between Isaac and a Rotterdam dealer, Leendert Hendricks. The two had entered into a contract more than two years prior (presumably in 1641) that had gone sour, and they ultimately turned to the guild for resolution. Although the date of Isaac’s formal entry into the guild remains unknown, his appearance here indicates he was a member by 1643. See Hessel Miedema, De Archiefbescheiden van het St. Lukasgilde te Haarlem, 1497–1798 (Alphen aan den Rijn, Netherlands, 1980), vol. 2, pp. 582–583 and 609; and Van Thiel-Stroman in Biesboer and Köhler, pp. 261–62. 3 Bernhard Schnackenburg, Adriaen van Ostade, Isack van Ostade: Zeichnungen und Aquarelle (Hamburg, 1981), vol. 1, pp. 33 and 49. 4 William Robinson in Seventeenth-Century Dutch Drawings: A Selection from the Maida and George Abrams Collection (Amsterdam: Rijksmuseum, Rijksprentenkabinet; Vienna: Albertina; New York: Pierpont Morgan Library; Cambridge: Harvard University Art Museums, 1991), cat. 88, p. 194. A painting of the 1670s by Jan Steen depicts a drunken woman stumbling toward a pigpen, as in the Dutch proverb “Wie een varken is, moet in het kot” (One who behaves like a pig belongs in the sty). See also Lyckle de Vries, Jan Steen: De Schilderende Uilenspiegel (Weert, Netherlands, 1976), p. 17 and pl. 56. 5 Isaac van Ostade, Drunken Peasant Couple (Fig. 1), oil on panel, 34.2 × 47.6 cm, sold at Sotheby’s, New York, 26 January 2007, lot 437, repr. The painting was sold as “attributed to Isaac van Ostade,” but with a catalogue note citing Bernhard Schnackenburg’s opinion, based on photographs, that it was in fact an early work by Isaac himself. Before then, the work was known by a black-and-white photograph in the Rijksbureau voor Kunsthistorische Documentatie/Netherlands Institute for Art History (RKD), which recorded its presence with the Paris dealer J. O. Leegenhoek in 1950. In his 1981 monograph, in citing the 1950 image, Schnackenburg referred to the painting as attributed to Isaac (“eines Isack van Ostade zugeschriebenen Gemäldes”); see Schnackenburg, vol. 1, under cat. 421, p. 161. William Robinson, who saw the painting at the 2007 sale, also believes the painting to have a genuine signature and to be by Isaac himself. Based on the photograph, the present author concurs. 6 Copy after Isaac van Ostade, Drunken Couple, 194 × 275 mm, ink and wash, sold at Weinmüller, Munich, 20–21 May 1941, lot 675, repr. pl. 44. 7 For the early sketches of peasant cottages, see Schnackenburg, cats. 416 verso, 419 verso (both in London, British Museum), 423 (Groningen, Groninger Museum voor Stad en Lande), and 424 recto (Amsterdam, private collection); see also Peter Schatborn, “Tekeningen van Adriaen en Isack van Ostade,” Bulletin van het Rijksmuseum 34 (1986): 82–92, pp. 85–86, fig. 12 (verso of fig. 11, Amsterdam, Rijksmuseum). 8 For his unpopulated exteriors and interiors of circa 1646–49, see Schnackenburg, cats. 565–80. William W. Robinson, Seventeenth-Century Dutch Drawings: A Selection from the Maida and George Abrams Collection, exh. cat., H. O. Zimman, Inc. (Lynn, MA, 1991), cat. no. 88, pp. 194-5, repr.